DMV.com was created to help simplify your life by providing you with all the vehicle related information and Maine DMV services you may need, in one place. Quickly find information and services regarding driving records, vehicle registration, drivers license renewal, license plate renewal, getting a learners permit, and finding a Maine Department of Motor Vehicles approved traffic school. Find Maine drivers license information to help with renewal, replacement and more. An ME BMV drivers license is required for drivers. Ordering Maine driving records online is fast and convenient. Obtain your ME DMV driving record without having to wait in line at the DMV. Find affordable Maine auto insurance online today. Car insurance is required by the ME BMV for resident vehicle owners and operators. Drivers who pass Maine traffic school may be eligible for ticket dismissals or insurance discounts. Learn about online traffic school in ME. Completing a Maine DMV practice exam will help you to earn a license. Take an ME DMV practice test online before you take the written test. Learn about replacing car registration documents, renewing car registration documents and more. 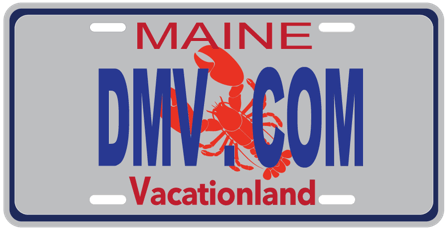 Maine car registration is required by the DMV. Maine drivers ed is required by the DMV for new drivers younger than 18. Reap the benefits of drivers ed classes in Maine by taking them online. Find out how to get a bill of sale from the ME BMV quickly and conveniently. A Maine car bill of sale serves as a receipt from a car sale. Find out how to pay a speeding ticket and how to fight speeding tickets in Maine. Traffic citations in ME require the driver to respond. Maine DUI laws mandate automatic license suspension and other DMV penalties. Learn about ME DUI consequences, and find more DUI information. Get resources to help you buy a used car or new car in Maine today. Buying a car in ME online can make your BMV registration quick and easy. You may need to visit a Maine DMV office to access some services. Find ME DMV locations, and get DMV contact details to make an appointment. DMV.com helps you skip out all DMV’s bureaucracy by offering you easy guides for drivers license, vehicle registration, license plate, emissions and other motor vehicle issues online. You’re in the right spot if you’re in a search of the most recent info about the Maine Bureau of Motor Vehicles. Let us guide you through the latest news on requirements or forms to fill in at your local DMV office in the easiest and fastest possible way. DMV.com is a privately owned website that’s not affiliated with any government agency, so serving well to you and making you skip all annoying government bureaucracy is our main priority. At our site you’ll find everything from informative and how-to-articles to tools and means how to deal with any DMV issues. If you’re owner of a car, motorcycle or boat, it doesn’t matter, cause here we’ve covered topics related to them all. Going through our articles is very simple. Just type in the right words in the “Search” bar above or use the navigating sections all over our site. Either way you’ll get the info you wanted in a way that’s easy to understand. We encourage you to engage with us on our Facebook fan page. Tell us your thoughts, comment our pages, rate the services at your local office. By doing so you’ll contribute to our site and help us provide even more fresh info.